Pregnant women do not need to suffer cold in pregnancy. Researchers believe chicken soup like this Cologne Jewish Penicillin has medicinal properties that shorten the length of cold in pregnancy and lessen the symptoms. Cologne Jewish Penicillin is a dumpling dish with a hearty chicken soup base. The basic recipe does not include vegetables like celery or carrot, common in other Jewish Penicillin recipes. These vegetables can be added if desired to make a unique chicken soup perfect for fending off cold in pregnancy. 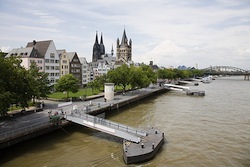 Cologne was the first German city populated by the Jewish community during Roman times. There is a strong Jewish cultural history in Cologne with three synagogues currently serving members, including the famous Roonstrasse Synagogue, which was rebuilt in 1959. Heat 1 tb shortening in a large stock pot. Add onions and sauté over low heat until translucent. Add 1 tb flour to onion mixture. Cook flour / onion mixture for one to two minutes, slightly browning. Add 1 tb paprika and stir. Add chicken and water to stock pot and cover. Cook chicken until almost done. In a medium bowl, beat 3 eggs. Add a pinch of salt to eggs. Add flour slowly and mix. When the egg mixture resembles dough, stop adding flour. Using a tablespoon and butter knife, dip dough with spoon and cut for dumplings per tablespoon into broth. Continue until all dumplings have been added. Cook uncovered for an additional 30 minutes. Remove chicken, debone and remove skin. Serve chicken soup in a deep bowl with dumplings. The egg dough will slightly thicken this Cologne Jewish Penicillin giving it a stew texture. The addition of paprika gives the dish a smoky flavor that pairs nicely with the chicken. This recipe can be adjusted to include boneless chicken, vegetables or a different variety of dumpling as desired.